Generative Design in Solid Edge ST10 is a new environment where you can define a specific material, design space, permissible loads and constraints and a target weight and the topology optimization engine automagically computes the geometric solution. Topology optimization involves determining the most efficient material distribution to meet the exact performance requirements of a part. Optimization takes into consideration the space allowed, load conditions of the part and maximum stresses allowed in the material. You can use old styled history based ,models or synchronous models or even imported from IGES, STEP, ACIS or Parasolid. The Generative Design tool in Solid Edge adds and removes material between the design features to make the part optimally stiff and lightweight. It also smoothens and blends surfaces to minimize stress concentrations. Look what generative design has done to this shabby looking lazily created lump model of a bicycle frame. The following optimized model of the above part was created using the default values using a single click operation. It looks masculine and curvaceous at same time and is aesthetically pleasing also. Introduced with Solid Edge ST10 Generative Design is the future of 3D modeling in Solid Edge. 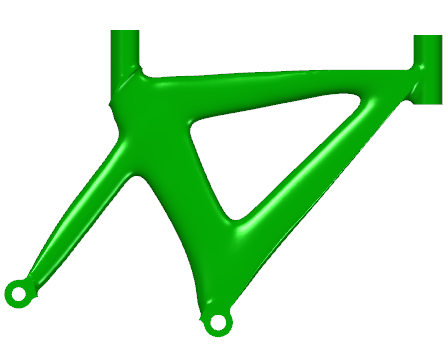 Here's a short video but if you want to download the raw model and learn how to create this beautiful bicycle frame design in Solid Edge using Generative Design, here's a simple click-by-click tutorial.